A native of Kensington, Berkeley West Edge Opera's new Artistic Director Mark Streshinsky has been a member of the staging staffs of San Francisco Opera, New York City Opera, Dallas Opera, Los Angeles Opera and Seattle Opera. With Berkeley Opera he created critically acclaimed productions of Eugene Onegin, Handel's Acis and Galatea, the American premiere of Legend of the Ring and the world premiere of Chrysalis, by composer Clark Suprynowicz and playwright John O'Keefe. Major directing credits include the Dallas Opera (La bohème and La Cenerentola) the Cincinnati Opera (Carmen, The Tales of Hoffmann, Lucia de Lammermoor), Lyric Opera of Kansas City (Handel's Guilio Cesare), Boston Lyric Opera, Sacramento Opera (Tosca), Detroit Opera (The Marriage of Figaro, La Cenerentola). Most recently he directed Seattle Opera's production of La Traviata. In 2007, Mark had great critical success directing the world premier of David Carlson's and Colin Graham's Anna Karenina which celebrated the opening of the Ziff Opera House in Miami and was subsequently performed at Opera Theatre of St. Louis. It was also the featured production of the 2007 Opera America conference. Mark took on this project when director and librettist, Colin Graham, passed away. Graham, one of Mark's mentors, chose him to carry on his work. Mark has also served on the faculties of West Coast Opera Works in San Francisco, Opera North in New Hampshire and Des Moines Metro Opera's young artist programs, staging opera scenes with young singers. He has also worked with vocal students at the San Francisco Conservatory of Music. Outside of the opera world. Mark has recently begun an association with The Crucible, a Center for Industrial Arts in Oakland, California. where he directs fire performers, circus performers and ballet dancers in an annual fire extravaganza. He started this association with an adaptation of Stravinsky's The Firebird. This past January he directed Dracul, with music by British composer Phillip Feeney. The Crucible has commissioned Mark to create the libretto and direct Machine, a world premiere fire opera, in 2011. Mark Streshinsky lives in Kensington with his wife, soprano Marie Plette, and their ten-year-old son, Evan. Jonathan Khuner has been Berkeley Opera's Musical Director since 1988 and and served as Artistic Director from 1994 to 2009. He has also worked as assistant conductor at the San Francisco Opera for over twenty-five years and at the Metropolitan Opera in New York for over ten years. Mr. Khuner also has conducted performances of the New Israeli Opera, the San Francisco Opera Center, West Bay Opera, Pacific Repertory Opera, Livermore Valley Opera, San Francisco Lyric Opera and the Tel Aviv Symphony. He has also appeared with Lyric Opera of Chicago, Santa Fe Opera, Miami Opera, Opera Barga in Italy and the Israel Philharmonic. In 1992-93 Mr. Khuner was resident conductor at the New Israeli Opera in Tel Aviv and in 1996 prompted Wagner's "Ring" in Bayreuth, Germany. He has been on the faculty of the Bay Area Summer Opera Theater Institute (BASOTI) for ten years and in 2005 was Music Director for the SummerSong workshop in Lafayette. For several years Mr. Khuner taught the Opera Workshop at the University of California, Berkeley, where he re-inaugurated this course at the invitation of the Music Department. He recently has become a conductor at California Opera's Summer Festival in Fresno with Edna Garabedian. Mr. Khuner's tenure with Berkeley Opera has seen not only a rise in production and performance standards, but also the creation of original versions of operatic repertoire. With such works as 2005's compressed Die Meistersinger with Yuval Sharon, Vivian Fine's Women in the Garden in 2002 and David Scott Marley's brilliant adaptations of several older works, Mr. Khuner has helped put this small company in the larger limelight. 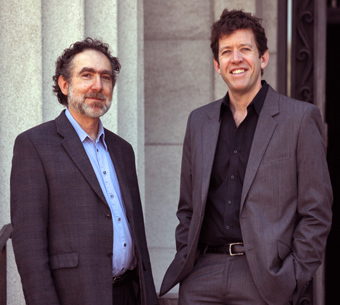 In 2004, with Mark Streshinksy, Khuner created Berkeley Opera's North American premiere of Legend of the Ring (a one-evening version of the Wagner epic, by David Seaman) to great acclaim and has led Berkeley Opera's presentation of new works: Serpentina by the late composer John Thow in 1999, and in 2006 Chrysalis by Clark Suprynowicz, whose Caliban Dreams Khuner led in its 2004 premiere at San Francisco's Magic Theater. In the fall of 2007 Mr. Khuner took on the additional duties of San Francisco Opera Guild lecturer, giving the preview lectures on Puccini's La Rondine.